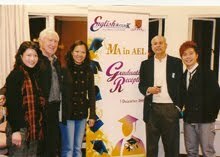 MA Programs in ELT / Applied Linguistics - ELT Consultant - George Braine, Ph.D. In 2005-06, I was appointed the Director of the MA Program in Applied English Linguistics offered by the English Department of the Chinese University of Hong Kong. Over the next five years, I enriched the program by offering elective courses taught by eminent visiting professors and promoted the program by generating wide publicity in Hong Kong and China. As a result, the number of applicants to the program grew steadily making it the most competitive MA program in applied linguistics/ELT in Hong Kong. This growth was achieved despite a doubling of tuition during the same period. • design a marketing plan. Fees: Negotiable depending on the services required. • surveying teachers and students. Following the review, I will make recommendations to strengthen your program academically and enhance its competitiveness. This will also help you to promote and expand your MA program.